I can be a bit of a snob sometimes. I don’t mean to be, but there are moments when seemingly out of my control, my East Coast upbringing kicks in and up my nose turns. It might be the result of poor manners, tacky decorating, or bad food. You know what I mean…those meals they served in elementary school like Sloppy Joes or Tuna Casserole? Up until a short period of time ago I would have included Meatball Subs in the shun-worthy category. 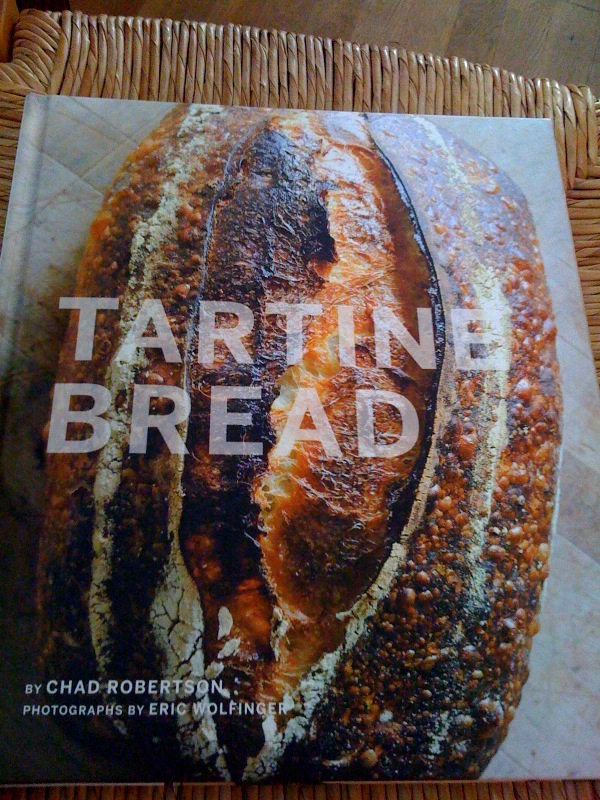 That is…until I tried the recipe from the “Tartine Bread” cookbook. These things are amazing. Granted…the addition of pesto, fontina, and arugula definitely provide for a lift in status, but in addition to that they’re just really dang tasty. Having reached Day 30 of my “Month of Exploration” these feel like the perfect culinary representation of what I’ve learned: Faster isn’t always better, glamorous isn’t always worth it, and sometimes it’s okay to admit you’re happy with just plain ‘ol good. Serve these for a casual weeknight dinner with friends paired with a great bottle of red wine, such as a Malbec. Preheat oven to 350 degrees and lightly grease a 9×12 baking dish. 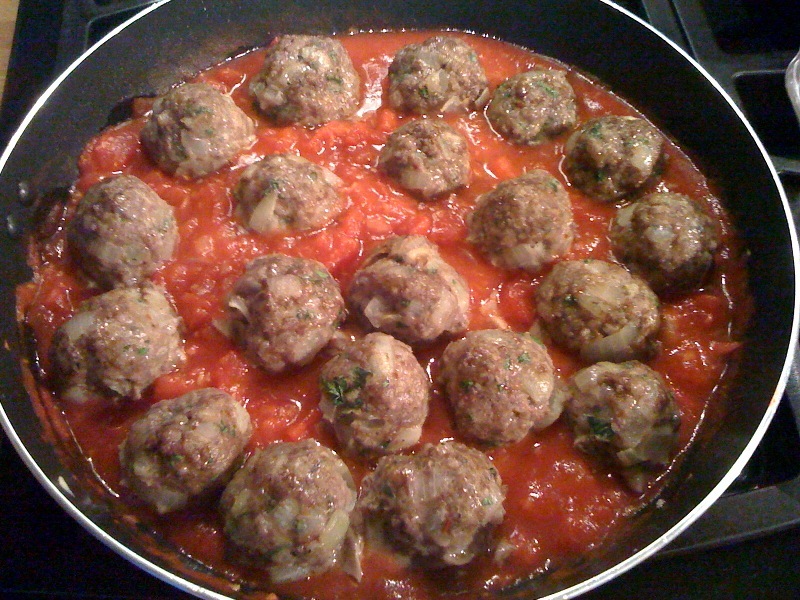 To make the meatballs, in a large deep skillet over medium-low heat, warm 2 TB of the olive oil. Add the onions and saute until they are translucent and beginning to color, about 15 minutes. Remove from the heat and let cool. 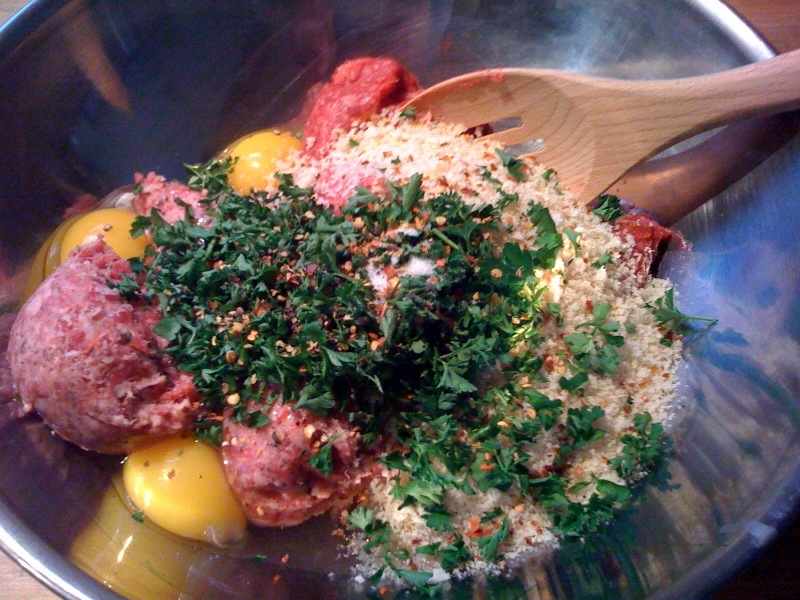 In a large bowl combine the beef, pork, eggs, panko, parsley, salt, pepper, red pepper flakes, and cooled onions. Mix well to combine. Form the meat mixture into balls the size of golf balls. Add to the baking dish and bake until cooked through, but not overcooked, about 25 minutes. Meanwhile, in the onion skillet add the remaining 1 TB olive oil over medium heat. Add the garlic and saute for about 2 minutes. Add the tomatoes and deglaze the pan, stirring with a wooden spoon to scrape up the browned residue. Bring the tomatoes to boil and reduce the heat to very low. Add the cooked meatballs to the pan and simmer for 20 minutes, turning occasionally. Spread the top half of each roll with the pesto spread. Add the cheese to the bottom half (skipping if you’re making lactose free) and top with meatballs and sauce. Add the top back on and loosely wrap in aluminum foil. Bake until the cheese has melted and the bread is crispy and toasted, about 25 minutes. To serve, unwrap from the foil, top with fresh arugula, and offer extra sauce for dipping. I can vouch for these lumps of goodness. I had seconds.